6LoWPAN is an acronym of IPv6 over Low power Wireless Personal Area Networks. 6lowpan is the name of a working group in the internet area of the IETF. The 6LoWPAN concept originated from the idea that "e;"e;the Internet Protocol could and should be applied even to the smallest devices,"e;"e; and that low-power devices with limited processing capabilities should be able to partici… pate in the Internet of Things. The 6lowpan group has defined encapsulation and header compression mechanisms that allow IPv6 packets to be sent to and received from over IEEE 802.15.4 based networks. IPv4 and IPv6 are the work horses for data delivery for local-area networks, metropolitan area networks, and wide-area networks such as the Internet. Likewise, IEEE 802.15.4 devices provide sensing communication-ability in the wireless domain. The inherent natures of the two networks though, is different. This book is your ultimate resource for 6LoWPAN. Here you will find the most up-to-date information, analysis, background and everything you need to know. 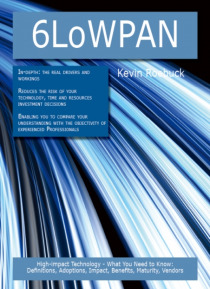 In easy to read chapters, with extensive references and links to get you to know all there is to know about 6LoWPAN right away, covering: 6LoWPAN, 6bone, 6over4, Ad-Hoc Configuration Protocol, AICCU, Anycast, China Next Generation Internet, Comparison of IPv6 application support, Comparison of IPv6 support by major transit providers, Comparison of IPv6 support in operating systems, Comparison of IPv6 support in routers, Cryptographically Generated Address, DHCPv6, DirectAccess, DoD IPv6 Product Certification, Hurricane Electric, ICMPv6, IPv4 address exhaustion, IPv6, IPv6 address, IPv6 brokenness and DNS whitelisting, IPv6 deployment, IPv6 packet, IPv6 subnetting reference, IPv6 transition mechanisms, ISATAP, NAT64, Neighbor Discovery Protocol, Next Generation Internet Program, OCCAID, Radvd, SATSIX, Secure Neighbor Discovery Protocol, Site Multihoming by IPv6 Intermediation, Solicited-node multicast address, Transformational Satellite Communications System, Tunnel broker, List of IPv6 tunnel brokers, Tunnel Setup Protocol, Unique local address, Where-Are-You, World IPv6 Day, HiperLAN, HiperMAN, IEEE 1900.4, IEEE 802.15, IEEE 802.15.4, IEEE 802.15.4a, IEEE 802.16, IEEE 802.20, IEEE 802.22, IEEE P1900, ONE-NET, WLAN Authentication and Privacy Infrastructure This book explains in-depth the real drivers and workings of 6LoWPAN. It reduces the risk of your technology, time and resources investment decisions by enabling you to compare your understanding of 6LoWPAN with the objectivity of experienced professionals.